Is it legal to own and use a police scanner? How do I choose a police scanner? Analog, Digital or Conventional Radio? What is the range of police scanners? Can I use police scanners to listen to cellular phone calls? Looking to purchase the best police scanner? You are not alone. It seems mobile or handheld police scanners are still an essential accessory for most drivers. This especially holds true if you do a lot of driving, or if you cover hundreds of miles on a daily basis. Did you know that you can turn your smartphone into a basic police scanner? It seems smartphones can do everything these days. These devices are not only good for texting, making calls, playing music, scan OBD2 trouble codes, and surf the web, but they can also perform the role of mobile police scanners. But nothing beats the old-school touch of a conventional police scanner. Why purchase an expensive smartphone when you can buy a brand new police scanner for less than $50? That type of value is hard to beat, especially if all you want is to stay informed and listen to the various things happening in your surroundings. But are police scanners legal? Can you actually buy and use a police scanner in your car? This Uniden Public Scanner with 300 channels is a bit more costly at around [click to reveal price], but it offers more features compared to other handheld police scanners. This device is capable of storing up to 300 channels in each of the 10 banks. It is also equipped with close call RF capture technology, this feature will allow you to automatically detect and tune-in to nearby transmissions even if the particular frequency is not stored in the channel. The Uniden Public Scanner also comes with ten pre programmed service search bands which make it easier to search for frequencies used by police, NOAA weather transmissions, and fire or emergency services. If you’re into NASCAR, then this device is perfect when listening to race control. This device is also equipped with a PC programming port and software so you can easily program the radio using a laptop or PC. This Uniden 500-channel Radio Scanner is better suited or home use. It costs [get lowest price] but is packed with great features that even novice users will appreciate. This police scanner is equipped with a 500-channel scanner so you can scan local public safety and other frequencies in your area. It also comes with a built-in FM radio so you listen to your favorite stations without using a separate device. It also has a built-in alarm clock so you can wake up to your favorite local channel. However, this device is a basic analog scanner and you will need to program the frequencies after plugging it in. This scanner is not ideal for picking up trunked or digital signals. The Uniden 500-channel Radio Scanner is also equipped with a small telescopic antenna. Don’t be fooled by the size of this antenna. It may be smaller than most mobile antennas, but it is powerful enough to pick up signals without the need for an external base station antenna. 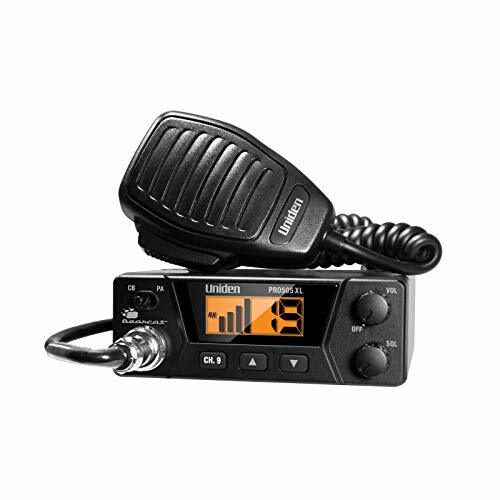 While it might not be a full-blown police scanner, the Uniden PRO505xl is a great CB radio that lets you listen and communicate with others. Sometimes the local law enforcement will use CB radios to communicate, but it’s not as common as it used to be. 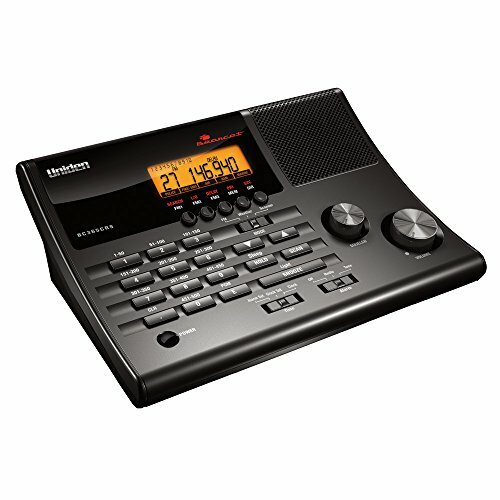 When it comes to price, features, and ease of use, it is hard to argue with the Uniden 40-channel CB Radio. This device costs less than [click for price] and is small enough to be installed in the dash or console of your car or SUV. Featuring a PA or public address function, you can easily hook up this CB radio to an external PA speaker. It also has an instant channel 9 function so you can set the radio to the emergency channel with a single push of a button. The Uniden CB radio is also equipped with a signal/RF power indicator. This makes it easy to check the strength of incoming transmissions on the small backlit display. This compact radio offers full 40-channel operation and is equipped with dynamic squelch control to produce clear and crisp sound. Perhaps the best feature that I love about the Uniden PRO505 is the simple and user-friendly layout. It has large up and down buttons so can change frequencies without taking your eyes off the road. Frequency Range: 145-148 / 420-450 MHz. Metallic upgraded, durable housing. English user manual included. Up next is another affordabl two-way radio option. 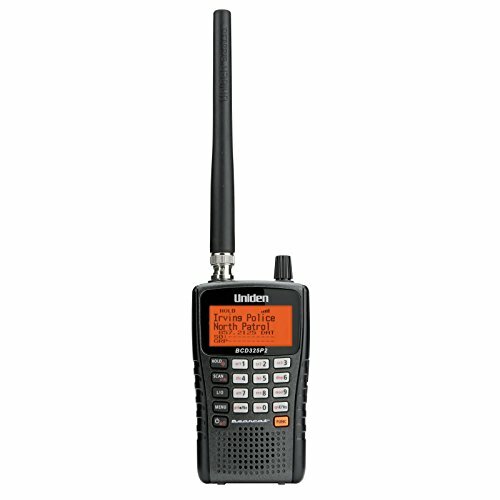 Similar to the Uniden PRO505XL, this isn’t the best option for scanning emergency channels, but is a great way to communicate. The Baofeng Black Two-Way Radio is equipped with an upgraded two color LED display. This device also comes with auto-band detection that eliminates using the band button entirely. What I really like about the Baofeng UV-5R V2+ is that it is compatible with UV-5R 3800 mAh and 360 mAh extended batteries. This makes it perfect for intense and heavy use. The device is equipped with a 7.4v 1800 mAh Lithium-ion battery and a charging dock for easy recharging when you run out of juice. Another great thing about the Baofeng is the price. 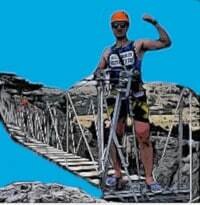 It’s a very cost effective solution and it’s built tough! This is thanks in part to the upgraded metallic housing. 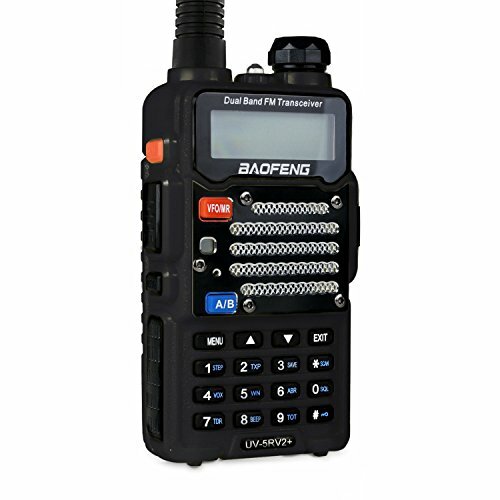 If you are looking for the best two-way radio for hunting, search and rescue, camping, and field training exercises, it is hard to go wrong with the Baofeng Black. The Uniden Trunk Tracker V Scanner is the wild card in this list. It costs five times as much as some of the other emergency scanners listed and is not exactly “cheap” for the budget-conscious civilian. But if you are looking for a more advanced police scanner, then you might want to check this out as well. The best thing about this device is that it follows communication on Apco-25, Phase 1, Phase 2, Motorola, EDACS, X2-TDMA, and even trunked systems. It is also equipped with close call RF technology that instantly tunes into nearby transmitters. Basically, you’ll be able to pick up the most emergency channels with this radio scanner. It has room to store up to 25,000 dynamically allocated channels. While this may seem too much for the average user, this police scanner is meant for advanced users. With that being said, the interface is a bit complicated to use for novice users. It is a bit tricky to program, and you will need to thoroughly read the user manual in order to master the features of the device. Before we discuss the best police scanners that we’ve used, it is best to tackle some legal issues so you know what you’re getting into. It depends. As it turns out, each state has different rules regarding the use of police scanners. The single best way to determine the legality of police scanners is to read the laws in your locale. This includes the use of conventional police scanners and police scanner apps for your smartphone or tablet. Don’t fret. As it turns out, it is legal to purchase and own a police scanner. In fact, it is perfectly legal to listen to the local police, county sheriff, state police, fire department, and even the military. But there’s a small catch. It might be illegal to listen to these frequencies if you take the police scanner out of your home, such as when you are driving in your car. This law not only covers conventional CB radios but even smartphones with police scanner apps as well. There are states that have no laws regarding the use of police scanners, but others are not so lenient. In states like New York, Florida, Kentucky, Indiana, and Minnesota, it is deemed illegal to use a mobile police scanner without securing a license from the FCC or the Federal Communications Commission. In other states like West Virginia, California, New Jersey, Michigan, Oklahoma, Virginia, and Vermont, mobile scanners can be used legally, but are illegal to use in the commission of a crime. Confused yet? Don’t be. The best way to determine the legality of mobile police scanners is to consult your local attorney. Because there are many types of different scanners in the market, I can’t blame you if it is hard to choose which one to buy. The good thing is that scanners haven’t changed much in terms of functionality. They are still basically two-way radios that allow you to listen to various frequencies in your area. Type of scanner. Do you need an analog, digital, trunked, or conventional scanner? You need to remember that you cannot convert an analog scanner into a digital scanner. If your state is currently utilizing digital systems, then it is only logical to purchase a digital police scanner. Digital and Analog are the most common radios these days. Form factor. Police scanners can come in a variety of shapes and forms. There are two basic types of scanners: desktop scanners and portable scanners. The former is ideal for home use. The latter is the ideal scanner to use in the car. Features. There are scanners with basic features, and there are those equipped with a variety of clever functions such as location programming. This is the type of police scanner that will program automatically after entering your ZIP code. Before choosing the type of radio scanner to buy, you need to make sure you get the right one. To check what your local emergency services utilize, head over to RadioReference.com. Search for your town and take a look at the tone. If the tone is 88.5 PL for example, you would need an analog scanner becuase the squelch code PL is analog. NCS and DCS are digital tones and require a digital scanner to pick up. Again, the answer will depend on a lot of factors such as your location, terrain, and the transmitter power of the agency that you want to listen to. Handheld scanners will generally have a range of about 10 to 20 miles, but this range will either increase or decrease depending on where you are. Now that would be great, wouldn’t it? Unfortunately, NO. You cannot use a police scanner to tune into your neighbor’s cellular phone. In fact, federal law prohibits the monitoring of private phone conversations. Digital police scanners utilize APCO-25 digital signals, while cellular phones use TDMA or CDMA digital signals. Absolutely. In order to improve the reception of your radio, you will need to purchase an outside antenna. If you are looking to buy a desktop scanner, you should look into purchasing a base station antenna. Mobile police scanners should be equipped with a mobile antenna to improve the reception as you drive along. The antenna is usually placed on the roof or trunk of your car. We highly recommend the Uniden BC75XLT if you’re just looking for a quality entry level police scanner. However, if you want to go all out, then the Uniden TrunkTracker V would be our choice of the best police scanners.